MEng (Biomedical Engineering) student wins the newly created Award co-sponsored by Santander and Professor Roger Crouch, Dean of the School of Mathematics, Computer Science & Engineering (MCSE). Gabriella Soffer, studying for an MEng in Biomedical Engineering, in the School of Mathematics, Computer Science & Engineering, (MCSE) is the winner of the newly created Dean’s Award for Professional Experience. The Award, valued at and developed by the School’s Professional Liaison Unit (PLU), has been inaugurated in association with Santander UK. Gabriella was a Student Analyst with the Department of Work and Pensions during her placement year. The PLU offers a variety of work-based learning programmes tailored to meet the varying requirements of employers and students in the School through the provision of placements, internships and work-based learning. "As well as Gabriella's success, the Award recognises the hard work the entire PLU team puts in to support our students. We hope Gabriella’s success will inspire many more students to take up placement opportunities in the future." 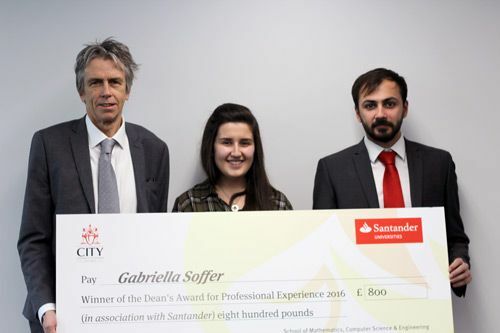 "We are thankful for the Santander's assistance in sponsoring this new Award which rewards academic excellence with practical work experience for students within our School, through the valuable support of our Professional Liaison Unit".